Miami, FL. 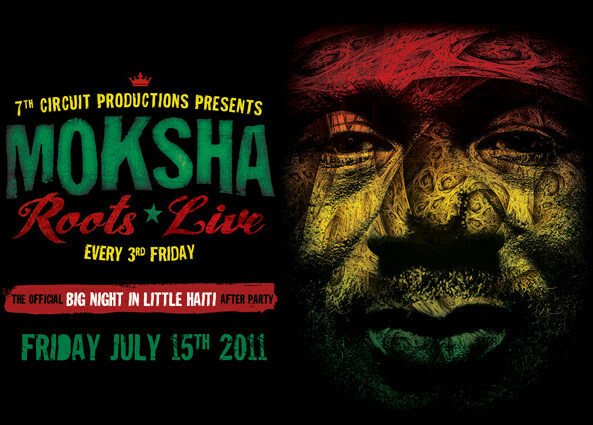 – July 15th, 2011–The party continues the third Friday of each month as 7th Circuit Productions and Moksha Family Arts Collective presents Moksha Roots Live. The after party for The Rhythm Foundation’s ~ Big Nights in Little Haiti. This month on July 15th it will feature the gallery, live music, D.J.’s, performances, live painting, and vendors. 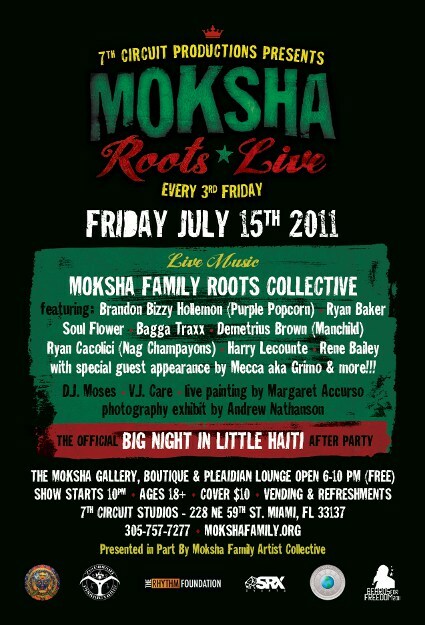 The Moksha Family Artist Collective is a non-profit organization all funds go to support our local artists and community projects. It’s an night to enjoy great entertainment and meet people while delight cultural music,mind-blowing art, and a harmonious atmosphere. Come and enjoy this evening of good vibes and amazing energy, while supporting the movement and keeping the vision alive. Brandon Bizzy Hollemon (Purple Popcorn), Demetrius Brown (Manchild), Soul Flower, Ryan Cacolici (Nagchampyons), Bagga Traxx, Harry Lecounte, Ryan Baker, Rene Bailey , Plus More!!! Also with special guest performance by Mecca AKA Grimo . With 20+ years in entertainment, Andrew Nathanson produces film/video, concert, special event and festival productions. Currently, he is shooting concerts for The Palm Beach Post (http://www.pbpulse.com/category/music/). Timed for Art Basel 2008, Mr. Nathanson Produced and showed photos in the group presentation, Timeline, showcasing top Miami artists in Wynwood. A multi-media piece was included in the group show Yellow at MYPAC in 2010. Also, several photographs included in Dystopia, a group show on Miami Beach. His first museum showing was PhotoMalasia at the Shacknow Museum (2004). He exhibited in 2004 parallel to Art Basel experience. DJ Moses opens the door to authentic high quality world music and invites you in to discover (and perhaps remember) how glorious, diverse and deep music can be. The African continent, Jamaica, Haiti, Brazil, the U.S. and Latin America are all represented in his selections. His past includes gigs with such luminaries as Baaba Maal, Thomas Mapfumo, Joseph Hill & Culture as well as many others. DJ Moses is one of a kind in our community. Originally from New York City, he has been living and working in Miami since 1995.